Never let it be said that Patagonia doesn’t listen to customer feedback. After fielding complaints that its wetsuits were too hot for semi-tropical waters, the outdoor-apparel manufacturer engineered the lighter-weight R1 wetsuit in both men’s and women’s styles. Manufactured from limestone-based neoprene and recycled polyester fleece, the new suit features the highest recycled content of any wetsuit on the market, according to Patagonia—a surfing industry first. Clad almost entirely in the textile, the R1 is lined in a blend of recycled polyester and spandex. Among the options the company considered was bamboo, although the material was subsequently dismissed because of its heavy use of chemical solvents, of which only 50 percent are recovered. Recycled polyester, on the other hand, is a clean, low-energy-intensive fiber to use and make, it says. Clad almost entirely in the textile, the R1 is lined with a blend of recycled polyester and spandex. Its core is insulated, but the arms and legs are unencumbered for better paddling flexibility (a feature requested by the company’s surf ambassadors). Like Patagonia’s wool-lined wetsuits, the warm-weather version is hand-stitched inside and out. Never let it be said that Patagonia doesn't listen to customer feedback. 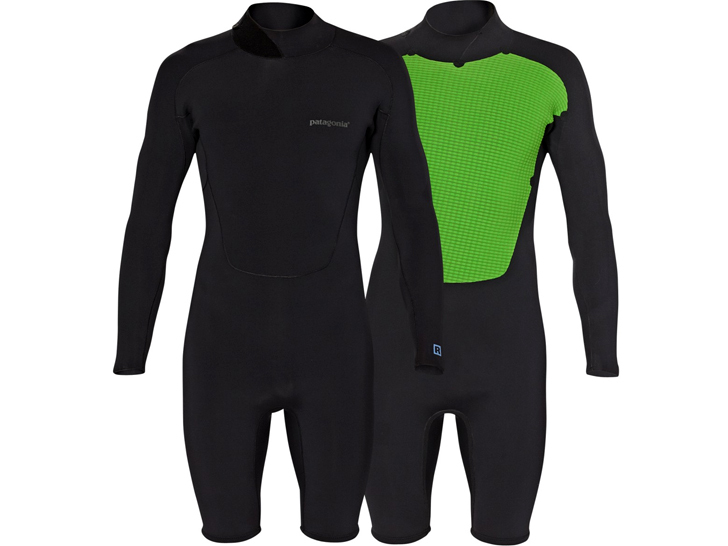 After fielding complaints that its wetsuits were too hot for semi-tropical waters, the outdoor-apparel manufacturer engineered the lighter-weight R1 wetsuit in both men's and women's styles. Manufactured from limestone-based neoprene and recycled polyester fleece, the new suit features the highest recycled content of any wetsuit on the market, according to Patagonia�a surfing industry first.